but if you have something else in mind, let me know! Prices include all fabric and batting. ​choice of Moda quilt shop quality 100% cotton fabrics! The photo to the right is a sample of a Variable Style quilt. ​You may include t-shirts, jerseys and other synthetic clothing! Include as many shirts as will fit in the size you want! ​The photo to the right is a sample of a Modern Style quilt. Print the Order Form / Estimate, fill out your preferences and mail the form and your shirts to the address shown on the form, i.e., Foxtail Quilting, 214 Woodland Drive, Trinity, TX 75862. Please pin notes to your shirts stating whether you want back, front or both sides included in your quilt. Please text or call 713.301.2459 or click here to contact Foxtail and let me know that your package is on its way. Upon receipt of your shirts, I will contact you to discuss your choices of backing sashing, backing and binding fabrics and any embroidery and appliqué requests. 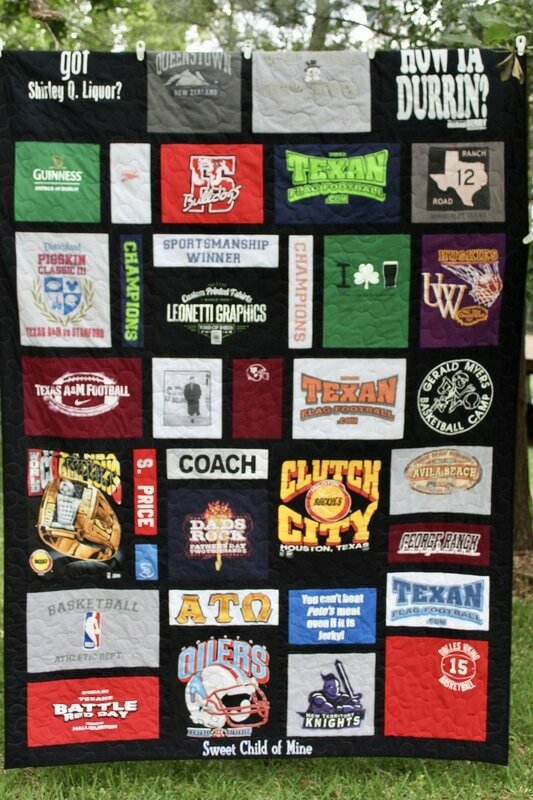 ​If you are ordering a memory quilt out of clothing other than t-shirts, please contact Foxtail by email or phone to discuss your project. USPS Priority Mail is a great way to ship shirts. They offer delivery confirmation so you'll know when your package arrives. If you have any questions that aren't addressed here, please contact me! I look forward to working with you on your project! ​At Foxtail, memory quilts are made with special attention to detail. 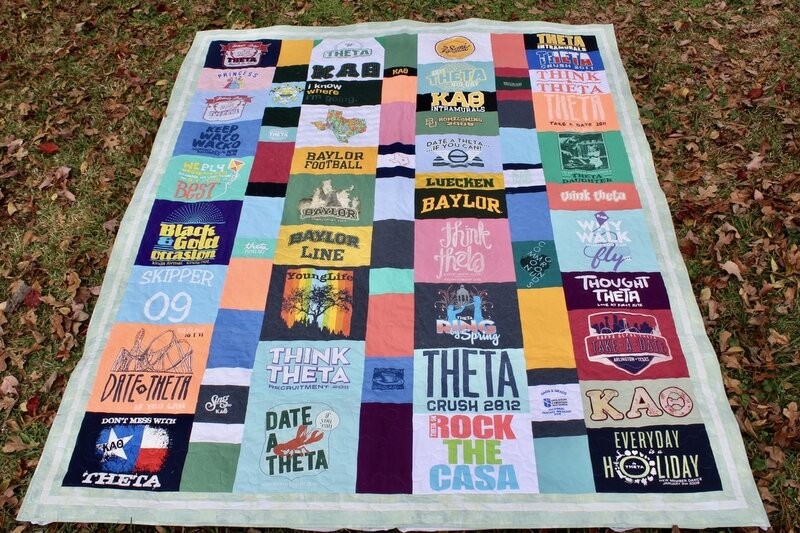 Whether you want to be involved or surprised, your project is given individualized attention, and it's understood that a bit of rearranging t-shirts, piecing blocks, added appliqué or embroidery may be necessary to get it just right. Hundreds of fabric options are available. I work with each customer during the selection process, narrowing down options for based on individual preferences. The memory quilts I have made to date fall into one of three categories. Click the links to view galleries of each style: Traditional Style, Variable Style or Modern Style. Shirts are reinforced with stabilizer to resist stretching. Stabilizer is now applied with a professional heat press rather than an iron. 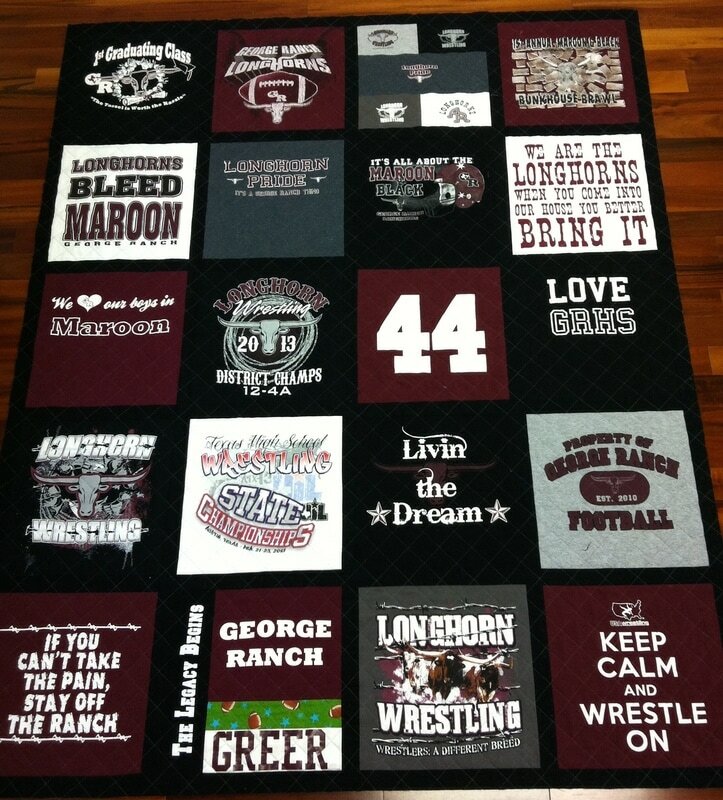 The base price of t-shirt quilts includes all fabric, batting and an overall hand driven meander quilting pattern. There's a one-of-a-kind quilt waiting to happen for you or your loved one. Contact Us to send an email message or call 713.301.2459 to discuss your project!